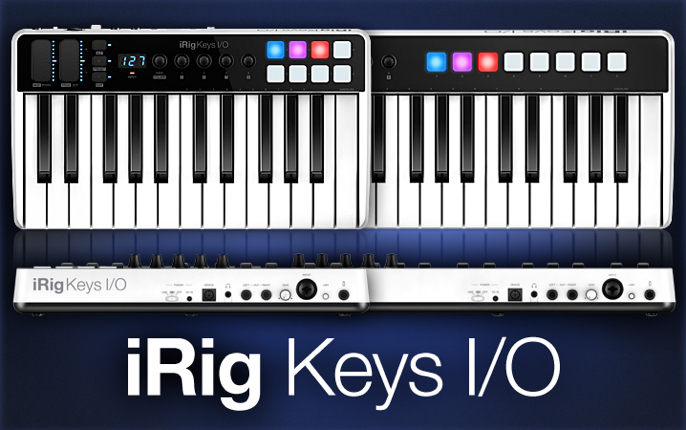 IK Multimedia is proud to announce iRig Keys I/O, the only keyboard controllers with 25 or 49 full-size keys for iOS, Mac and PC to offer built-in high definition audio input/output and a massive software bundle are now available worldwide. iRig Keys I/O features a professional 96kHz/24-bit capable audio interface including a Class A preamp with combo input jack for line, instrument or mic input including phantom power, 1/4” balanced stereo outputs and a high quality 1/8" headphone output ideal for use with the latest iPhone. All of this makes iRig Keys I/O the ideal creative tool for studio or live use. Last edited by Peter - IK Multimedia on Fri Mar 02, 2018 8:02 am, edited 1 time in total. Follow IK on Facebook for flash giveaways, exclusives, and more. SampleTank 4 announced and available for pre-order. That does sound good. I'll let the team know about this suggestion. Thanks! seems like it will be another month according to some sellers in europe. so why not stop flooding this very forum with announcements that ik can't meet at all? dermichl wrote: seems like it will be another month according to some sellers in europe. so why not stop flooding this very forum with announcements that ik can't meet at all? I'm sorry that your dealers do not have stock but we are fulfilling orders and have met initial dealer orders. Sometimes the demand for a product is higher than expected (and we do rely on dealers to order enough to fulfill the demand they expect to see) and in those cases there is sometimes a shortage of stock. We will always suggest that dealers order enough stock before the product is released and do our best to help them assess demand, and will continue to help improve this process going forward based on the exceptionally high consumer demand for products like iRig Keys I/O. I would love to see so,e feedback on the keybed quallity.. Even musik store was out of stock after the hollidays.. The irig keys pro keybed didn’t cut it for me. any reports on this device already? dermichl wrote: any reports on this device already? I don't see a written review on Thomann.de but the user that rated there gave it 5 stars. Hopefully more users can chime in here for you. Thank you so much for the kind words! One note on the cable length: We would love to make cables very long but certain connections need to be within the parameters set by Apple in order to be officially Apple MFi certified. During the month of March 2018, when you buy an iRig Keys I/O 25 or iRig Keys I/O 49 from the IK Online Store or any participating IK reseller, you can get a FREE iRig Keys I/O Mic that lets you record vocals or instruments anywhere!